Insurance - Swope, Rodante P.A. Often, the person, group, or business that injured you has insurance to cover themselves against liability. Insurance is the practice of guaranteeing compensation to the injured party in the event of loss, damage, illness, or death in exchange for an insured’s payments to the insurance carrier. An individual may choose to purchase insurance to guard against personal liability so their assets are protected in the event of an accident. Other times, society requires people to buy liability insurance if they are going to engage in certain activities. The following occupations are often times required to carry liability insurance. The government regulates that any business operating commercial trucks must purchase a minimum amount of bodily injury liability and property damage liability insurance. This insurance is to make sure that anyone injured as a result of a truck accident receives damages for their injuries. The insurance required depends on many factors, including the weight of the truck, the condition and age of the truck, the location of the truck, and the type of operation the truck would be used for. Doctors also purchase insurance so they are financially covered in case they are sued for medical malpractice. Almost every single state requires practicing doctors to purchase liability or malpractice insurance so patients may recover for their damages in the event of negligence. As fun as it may seem, operating a bar involves a lot of risks. A bar may not only be liable for anything that happens on the premises, but for anything that happens as a result of serving the wrong person too much alcohol. A common example is when a bartender serves too many drinks to a patron and the patron ends up getting into a car accident. Anyone injured in that accident could sue both the drunk driver and the bar’s owners. Liability insurance protects an individual or a business from being held liable by a third party for any negligent action or inaction that caused bodily injury or property damage. These policies only cover civil liabilities, not criminal liabilities. 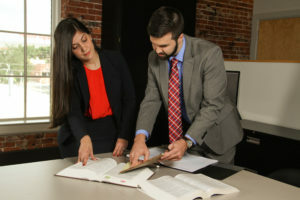 There are several types of insurance policies that usually contain some form of liability coverage, including automobile policies, homeowners policies, commercial general liability policies, professional liability policies, specialty liability policies, excess and umbrella coverage, and uninsured motorist policies. When you enter into a contract with an insurance company, you expect that this company will honor your insurance agreement by acting in your best interest in investigating, evaluating, negotiating and settling, if possible, any claims brought against you. There is an implied covenant for the insurance company to act in good faith and fair dealing under the insurance contract. The insurance company also has a fiduciary duty to act fairly and honestly and with due regard on your behalf. Unfortunately, this doesn’t always happen. The insurance company may be more concerned with its bottom line than doing what is right. Some examples include excluding a claim which the company knows should be covered, mishandling your case by failing to resolve a claim against you within a reasonable period of time, or attempting to settle the claim for less than what a reasonable person would pay. All of these examples demonstrate when the insurance company acted in bad faith, and you have a right to recover damages from them as a result of their negligent conduct.